On today’s How To Tuesday, I’d like to show you how to do Strip Fusing. (Don’t worry, strip fusing has nothing to do with the amount of clothing you are wearing.) It is simply a collage technique using strips of fabric to make a striped pattern. 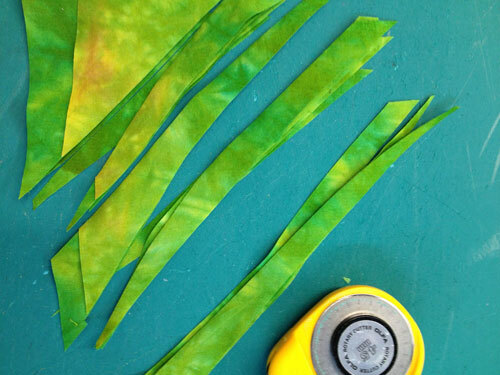 Cut fused fabric into strips measuring about 1/2″ to 1″ wide. Use straight or decorative rotary cutter blades or free cut the strips. 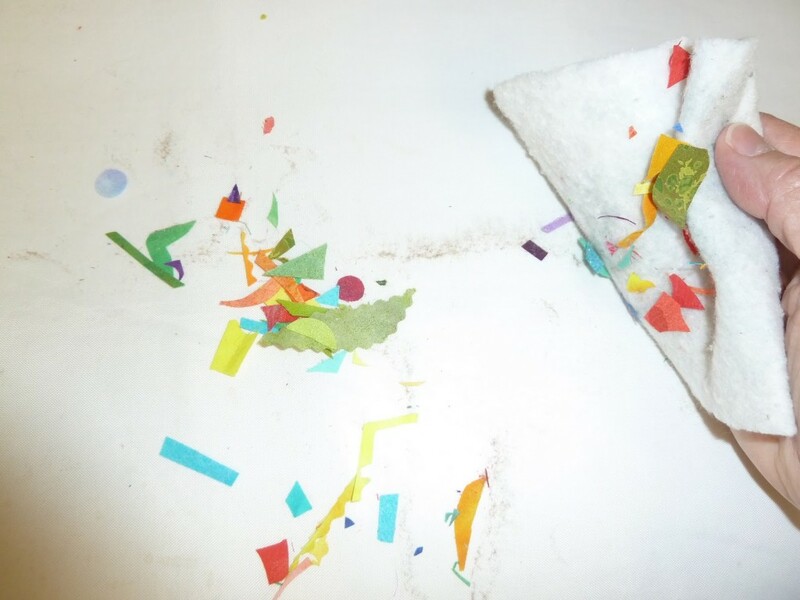 Lay a strip of fabric, glue side down, onto silicone release paper or parchment paper or a Teflon sheet. Fuse-tack into place. Overlap another strip about 1/4″ on top of the long side of the first strip. 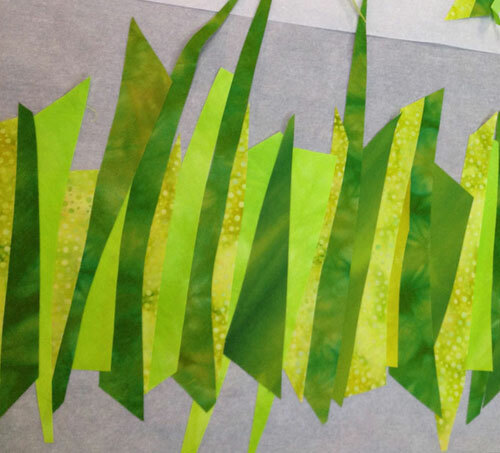 Continue to add strips across the paper. Always overlap darker value fabric onto lighter value fabrics. If you put light value on dark value, a shadow is cast on the light fabric. Continue to add more strips until the set of stripes is the length you want. 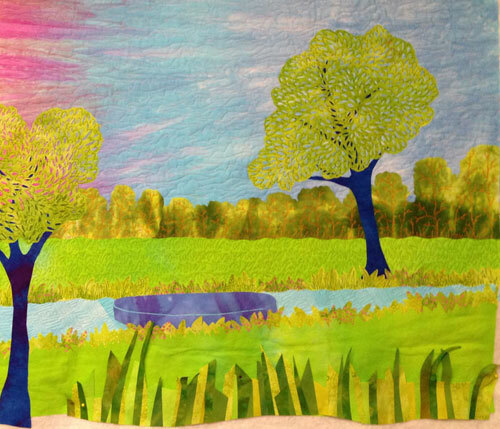 After the fabric cools, remove the strip fused collage from the release paper. Cut into any shape you like. Here you see the strip fusing become the grass at the lower edge of the design. The old “Put a Bird on It!” trick has worked for me again. 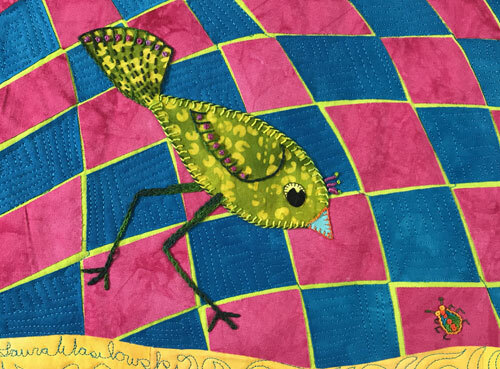 Imagine this quilt without the bird. Without the bird, it’s just a lonely hill with some trees on top. Not all that interesting is it? But add a curious bird checking out a bug and you have drama and action! It’s like a movie staring a restless bird startled by and innocent bug who has lost his way. What will happen next? Does the bug have a chance? 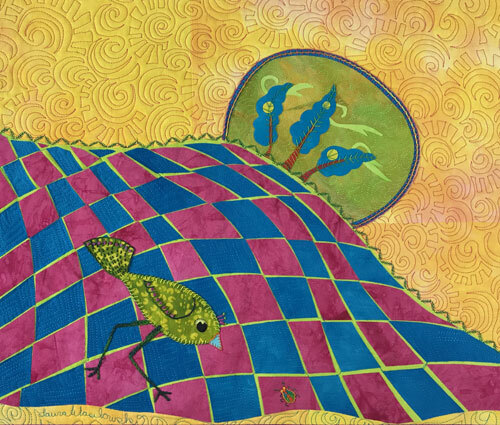 Will the bird’s curiosity cause a major change in the way of the world? Stay tuned….. 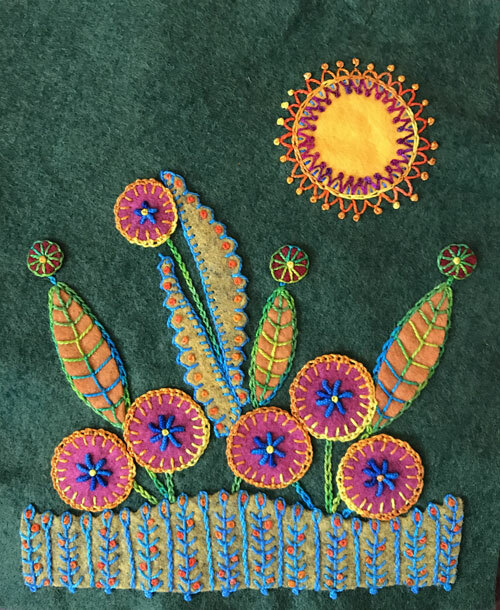 In preparation for a new class in July at Quilters’ Affair, I’m making multiple garden stitcheries using felt shapes and size 8 pearl cotton threads. This one was going along great until I got a little carried away. See all those yellow Lazy Daisy stitches filling in across the bottom section? Don’t you think it’s a little too cluttered? 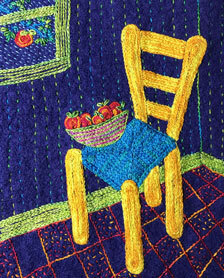 The reason I like working with the felt is that it has a clean, simple look that is easily enhanced by embroidery. But those yellow Lazy Daisies are messy looking. They really bug me! So I’ll spend a little time ripping them out and come up with plan B. What ever that is! 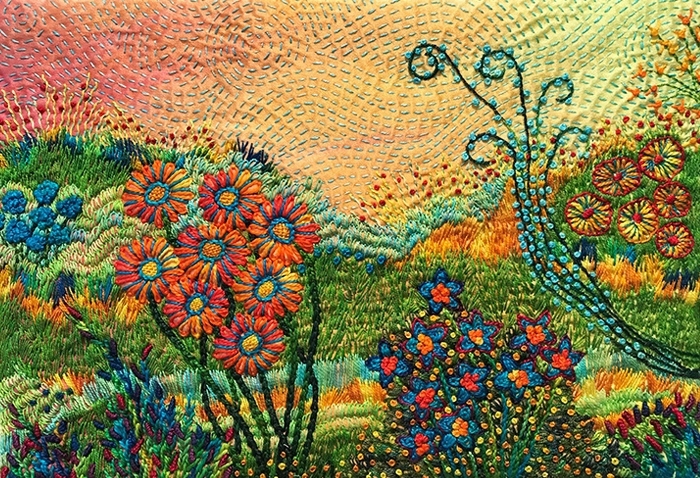 Would you like to see beautiful hand embroidery and learn more about embroidery artists from around the world? Then I recommend the weekly Inspirations All Stitched Up newsletter from Inspirations Studios. The stitch projects are amazing and the photography is gorgeous. I know you’ll enjoy it. 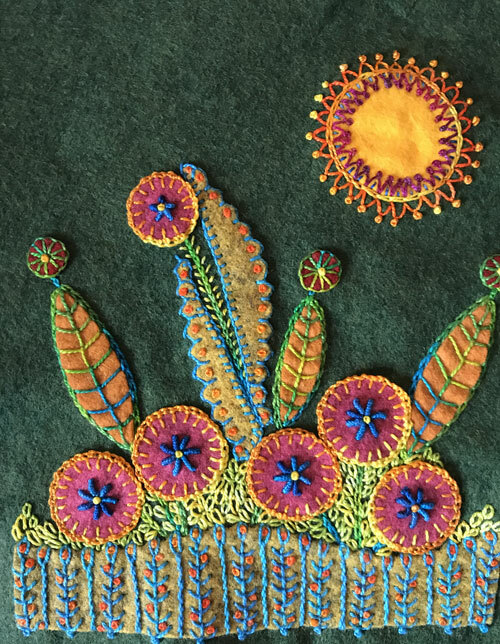 In the February 15, 2019 issue #173 of the newsletter, you’ll find my work under the What Are You Stitching? section near the bottom of the newsletter. See it here. You can also sign up for the newsletter at the bottom of the page. It’s like eye candy for stitchers! As you may have guessed, I am a total Neat Freak. And if you guessed this, you would be wrong. Cause I am neither neat, nor tidy, nor clean when I sew. There are fabric and thread clippings everywhere! But I do have a cleaning tip for you. Use batting. 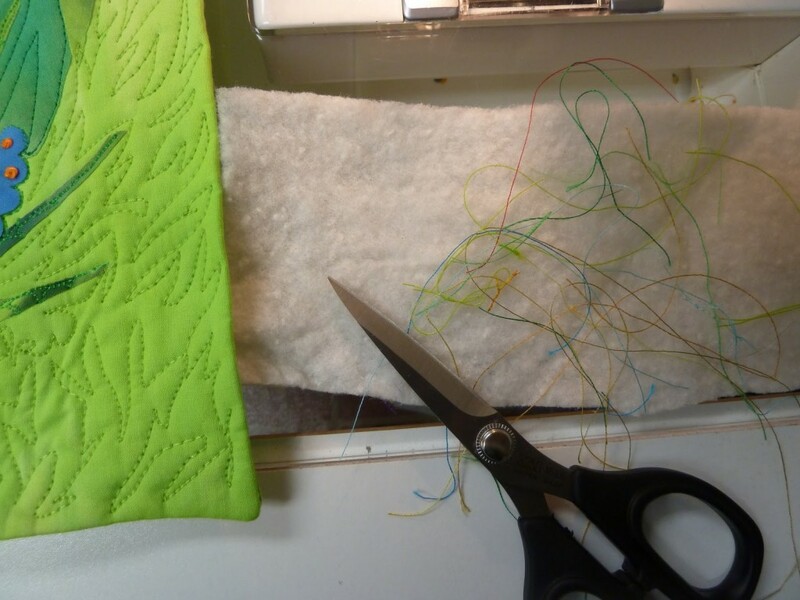 Place a small square of batting next to your sewing machine and drop your thread snips onto it. It’s a good way to keep the threads from slipping to the floor. And here’s another use for batting. Make a small ball and throw it to your cat. My cats would go nuts over a ball of batting. Not sure why. Who knows what’s going on in the brain of a cat? Another cat related item. A student in my class who loves cats had a bag that said “I’m just one cat short of crazy.” Keep that in mind all you cat lovers out there! Who’s Feeling Bright and Sunny Today? As winter doth drageth on in the northern hemisphere, I am reminded that the days ARE getting longer and there shall be light eventually. But first, I must shovel snow. And then enjoy my messy studio where it is always sunny and bright! Why? 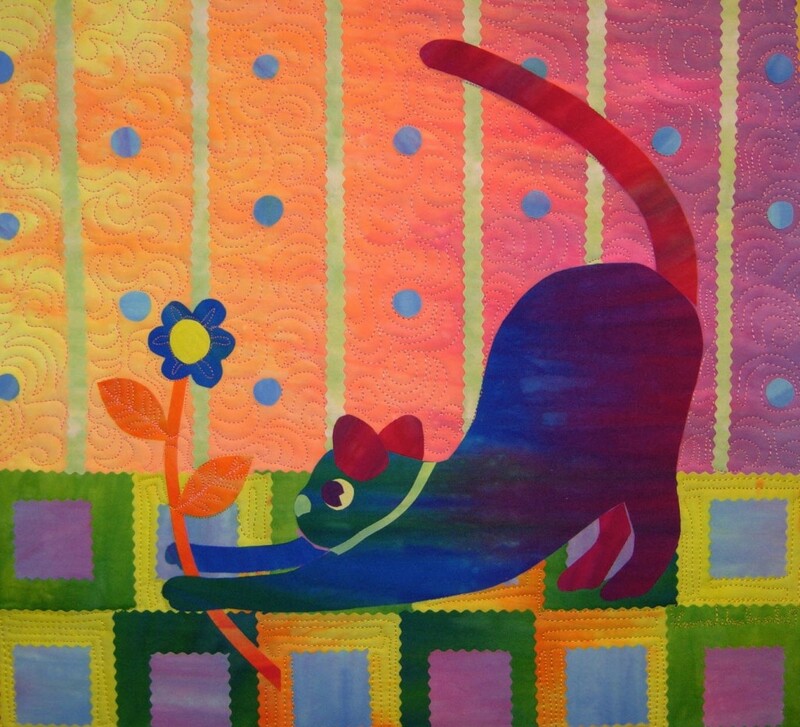 Because there is fabric to play with and imagination to be explored. Have you fondled your fabric lately? Maybe it needs your personal attention right now. We don’t want our fabric to feel lonely. Hope your days are sunny and bright!